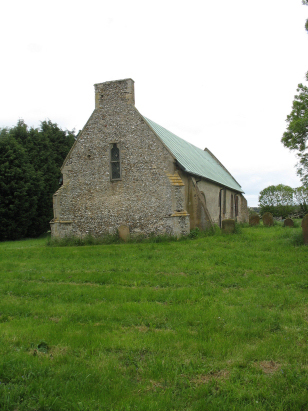 The tiny parish of Shingham lies in western Norfolk about 4 miles southwest of the market town of Swaffham. Shingham is located on a dead-end lane just east of Beachamwell and south of the A1122 road which connects Swaffham and Downham Market. There is no village as such to Shingham just farms and cottages and few of those. This was always a sparsely populated area on the edge of Breckland and devoted mainly in the past to sheep pasture on the poor sandy soils. The soil has been ploughed more often these days but is subject to frequent loss due to wind blow, man has created a landscape with trees in shelter belts to minimise this. What land is not farmed is devoted to forestry and there are many popular walks through the conifers of this area. St Botolph's church is tiny, nave and chancel combined and tower-less. It sits adjacent to the parishes only lane and a track or two that head purposefully off to other parts. Despite it's small size the church is an old structure with a Norman doorway and window much else is of the 14th century. 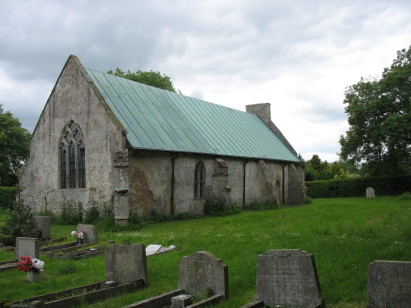 The church is no longer used for worship and in the early 20th century was described as dilapidated - thankfully no longer the case as it's clearly being cared for nowadays. During 2016 Shingham finally deposited the baptismal register covering the period of this transcript. As the original transcript had been prepare from the incomplete Bishop's Transcripts this has been removed and replaced with a new transcript prepare from the newly deposited register. This register is filmed on Microfilm MFRO775 in the collection of Norfolk Record Office. The film, as a recent production, is of excellent modern quality making for a straightforward piece to prepare.